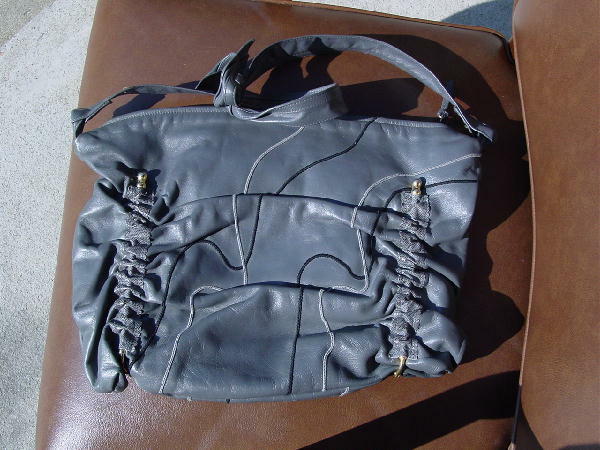 This large, roomy authentic reptile and leather shoulder bag is in a dark warm gray. 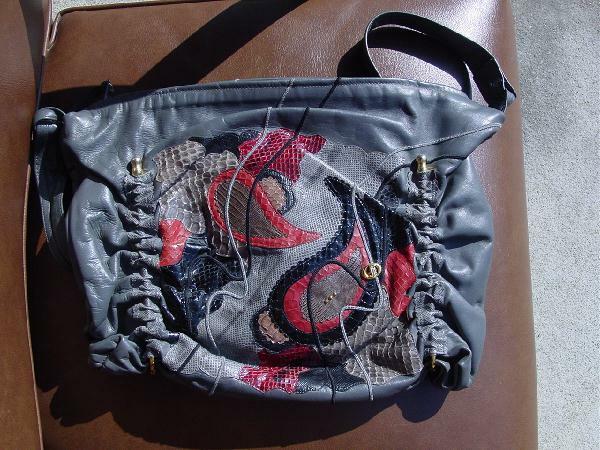 It has a top side to side zipper and a 31" shoulder strap that is tied in the center. It has reptile accent pieces in the front and back in dark gray, and in brown, black, red, and salmon-rust on the front. There are 2 gold-tone accent rods that go from front to back. Freeform lines in black and gray cord go from front to back as well. The roomy interior is lined in a dark brushed fabric and there are two interior pockets, one of which zips. It was used in a magazine photo shoot with gray and black leather and snakeskin open-toed slingbacks, a red Wilson's leather miniskirt, and a sequined black angora and wool Kenar sweater. See our inventory for similar matching items. This is a fabulous carry-all that can compete with any top designer's interpretation. Falchi anyone?